If you should stand, then who’s to guide you? There are moments in life that are considered “defining:” seemingly ordinary events that mark a transformation from what was before into all that is after; simple choices that irrevocably alter the course of one’s life; slight actions that powerfully shatter old stereotypes and give birth to new images. Napoleon signals the battle to begin at Waterloo, Rosa Parks selects a seat on a Birmingham bus, and four airplanes take off from a Boston airport on one ill-fated day in September 200l: defining moments. Destiny is at hand. For Matthew Bogue, the opportunity to redefine himself occurred on a sunny September afternoon in 1997. Standing on a windblown cornice of New Zealand’s Treble Cone Mountain, facing down the steep descent of the Motatapu Chutes, he knew only two things: he was absolutely terrified of skiing alone down that icy couloir; and, he absolutely had to do it. As an extreme skier, Matt had faced many such challenging slopes before and was accustomed to sailing off cliffs and cornices, soaring over talus and jutting boulders, accelerating down narrow chutes at death-defying speeds. He knew well the tension between fear and boldness and the stunning exhilaration that results from balancing on the fine line down the middle. This, hurtling down the craggy face of God’s most brilliant handiwork, was surely his destiny. He had known it for most of his life. But, on this day, with an ocean of cloudless blue sky coaxing him to dive, snow glistening like gems beneath his skis, his fear was so much greater than the present risk of the mountainside, his challenge so much more imposing than a 7,000 foot peak. For, Matt was battling the unknown, the mystifying disease Multiple Sclerosis, which had already claimed his eyesight. Legally blind, he was attempting to ski alone down a sheer mountain slope he could scarcely see. 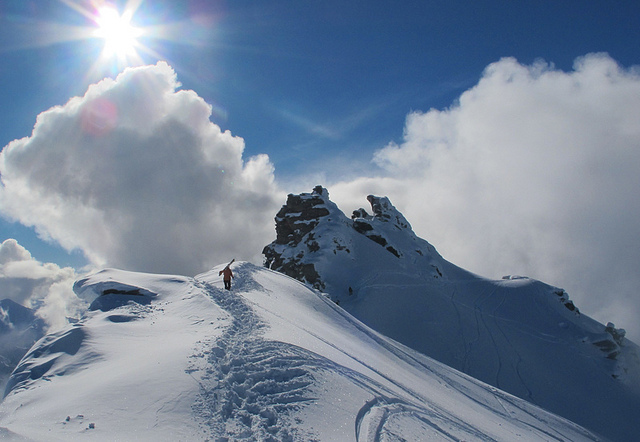 After a day of resort skiing, his two buddies had accompanied him to this ridge, at the top of the Motatapu Chutes, the backside of Treble Cone Ski Area, New Zealand. Encouraging him to challenge himself, perhaps hoping Matt would find his own path, his friends left him alone on that precipice to face his fear. And Matt, heroically, took the challenge. Pointing his skis down that glacial chute he maneuvered between boulders and bizarre protruding ice forms, which had been sculpted by freezing winds. Carving precise, short-swing turns on the narrow ribbon of ice crust, he made his way down the slope until he felt satisfied that he had gone far enough. Then, skis in hand, he hiked back up the very same path, only to ski down it again and again. Such is the nature of courage: to grab hold of fear and master it not just once, but over and over again. And such courage is exactly what is needed to live with a disease like MS, for the challenges are relentless and unpredictable, and you must pick yourself up time and time again. On that day, on the Motatapu chutes, Matt was a true hero, not because he was wholly courageous, but because he was wholly terrified, and did what was necessary anyway.